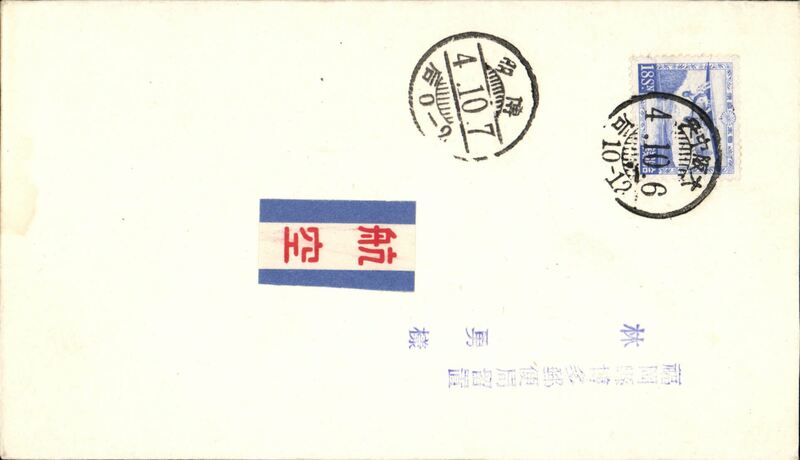 F/F Osaka to Seoul, arrival ds on front, special card franked 16 1/2 sen air, red/white/blue Japanese airmail label. 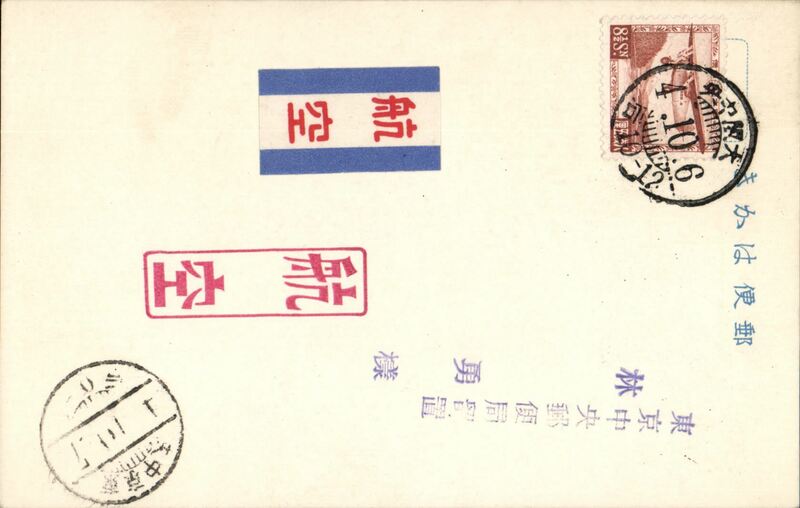 F/F Osaka to Tokyo, arrival ds on front, special card franked 18 sen air, red/white/blue Japanese airmail label. 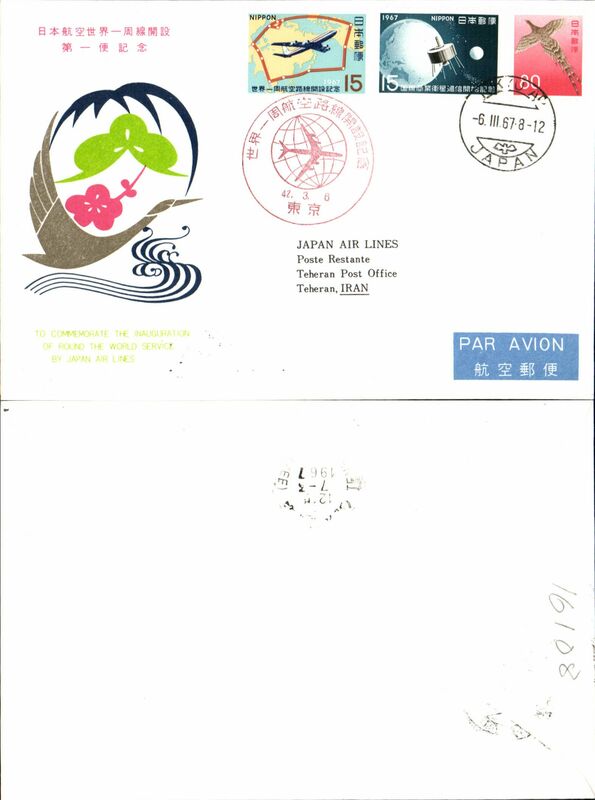 F/F Osaka to Fukuoka, arrival ds on front, special card franked 8 sen air, red/white/blue Japanese airmail label, red framed Japanese 'airmail' chop. 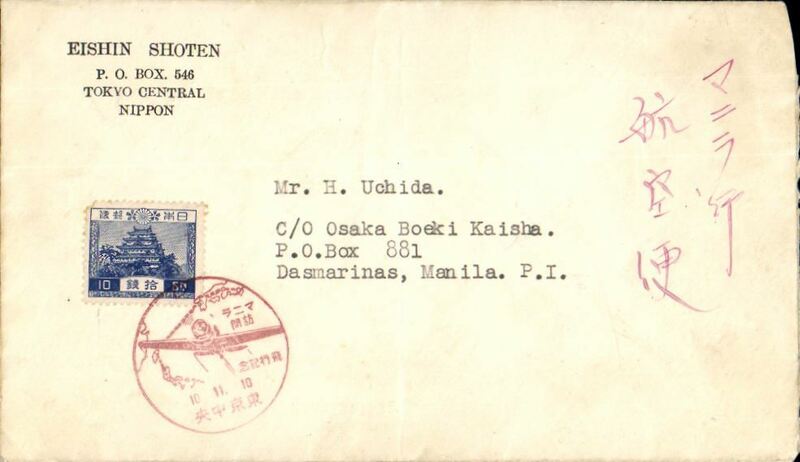 Japanese Goodwill Flight in honour of the inauguration of the Commonwealth ofthe Philippines on Nov. 15, 1935, Tokyo to Manila, bs 12/11, commercial corner cover franked 10Sn, with the commemorative cancel for Tokyo, Flight “Cachet” Type 72a in brownish red. 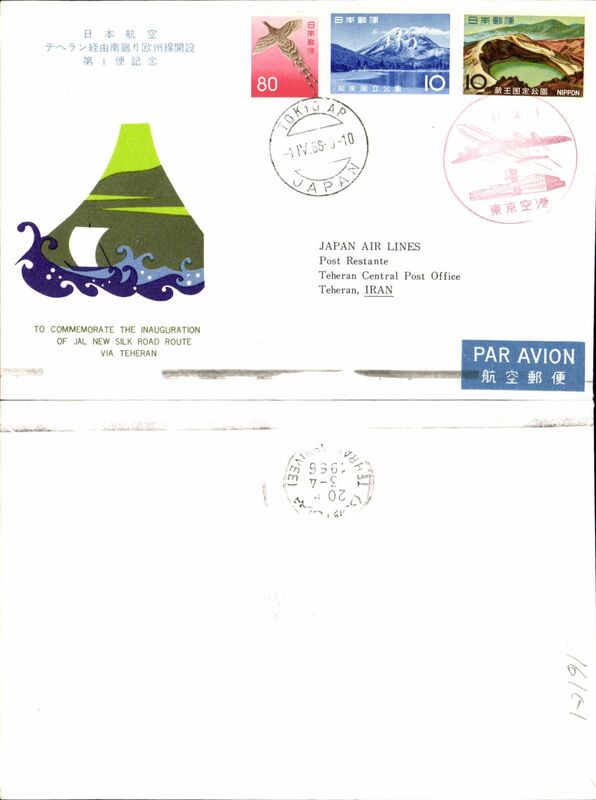 Pan Am F/F Jet Stream Service, Tokyo to Honolulu, bs 31/12/53, air cover franked 70y, canc 'Tokyo/1.1.54' cds, framed green flight cachet. "Arrived in Hawaii before it left Japan!". F/F, Okinawa (Naha)-Tokyo, cachet pm, cachet, b/s, printed souvenir cover, JAL. 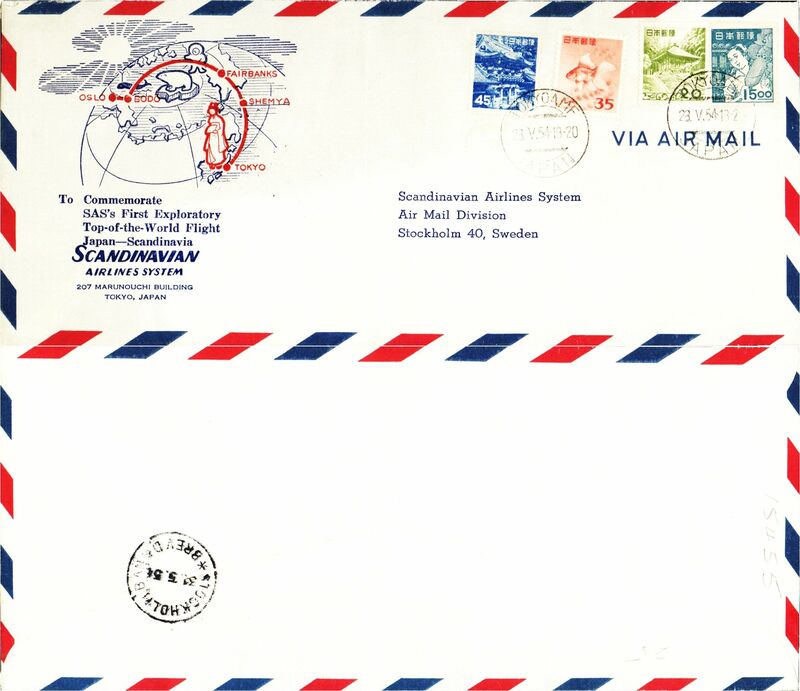 SAS 1st experimental flight via North Pole, Tokyo-Stockholm, bs, company souvenir cover, 20x10cm, with map of route - Tokyo-Shemya-Fairbanks-Bodo-Oslo-Stockholm. Faint ironed vertical crease, otherwise fine. F/F, Tokyo-Sapporo, cachet, b/s, company corner cover, 21x9cm, JAL. KLM 1st Polar Flight Tokyo to Amsterdam, bs 5/11, blue/black/white souvenir cover franked 60y canc special red F/F postmark, also green KLM flight cachet. 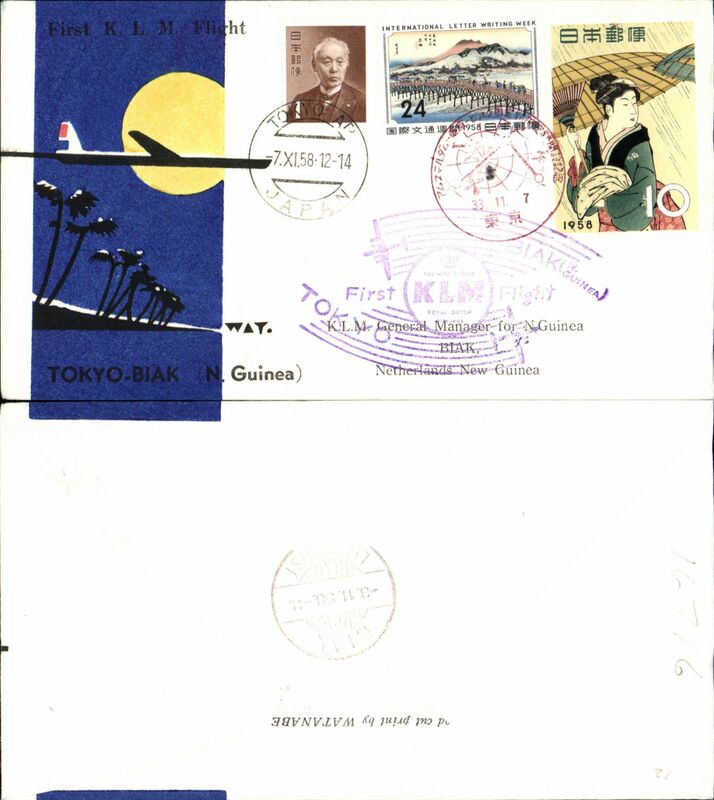 KLM F/F Tokyo to Biak, New Giunea, bs 8/11, blue/black/yellow/white souvenir cover franked 35y canc special red F/F postmark, also large violet KLM flight cachet. 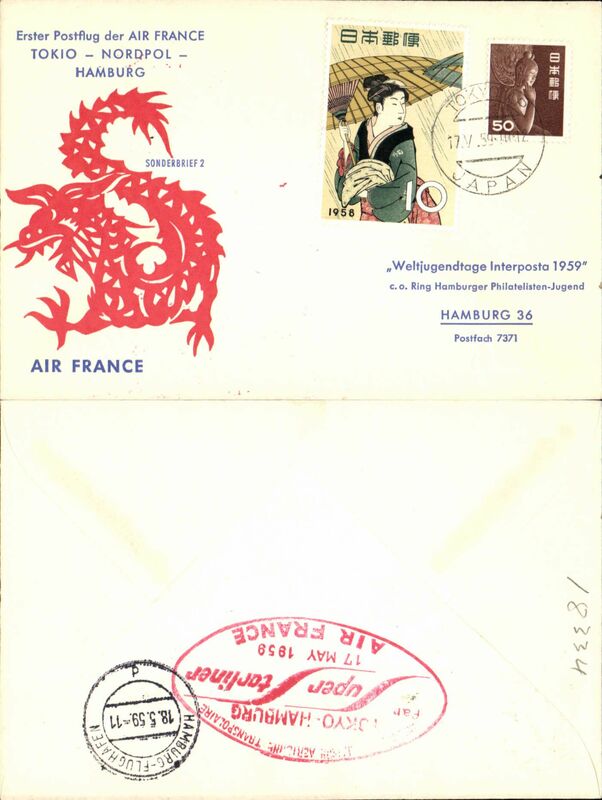 Air France F/F Tokyo to Hamburg, b/s, 18/5, red/blue/cream illustrated souvenir cover, large red oval flight cachet verso. Pan Am, first trans Pacific jet, Tokyo-San Francisco, cachet, b/s, air cover. 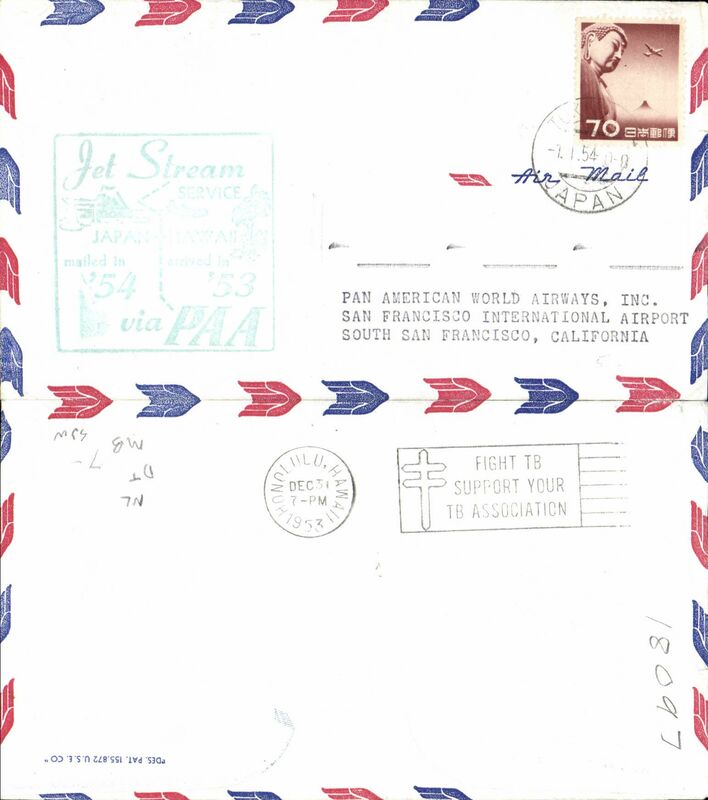 Pan Am, first trans Pacific jet, Tokyo-Los Angeles, cachet, b/s, air cover, 20x10cm. 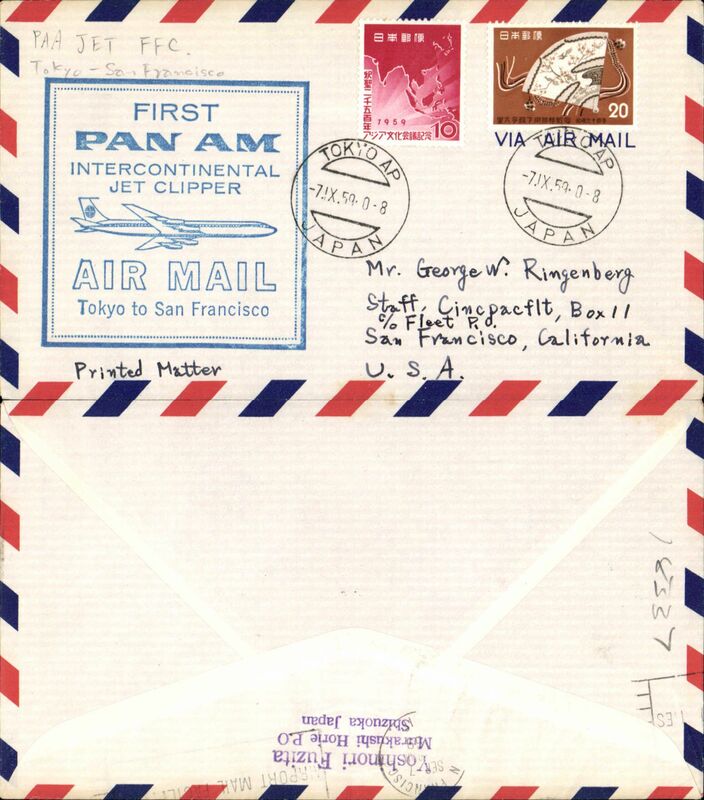 Pan Am, first trans Pacific jet, Tokyo-San Francisco, cachet, b/s, air cover, 20x10cm. Memorial flight, Nagoya-Tokyo, special depart cancellation, b/s, blue cachet. 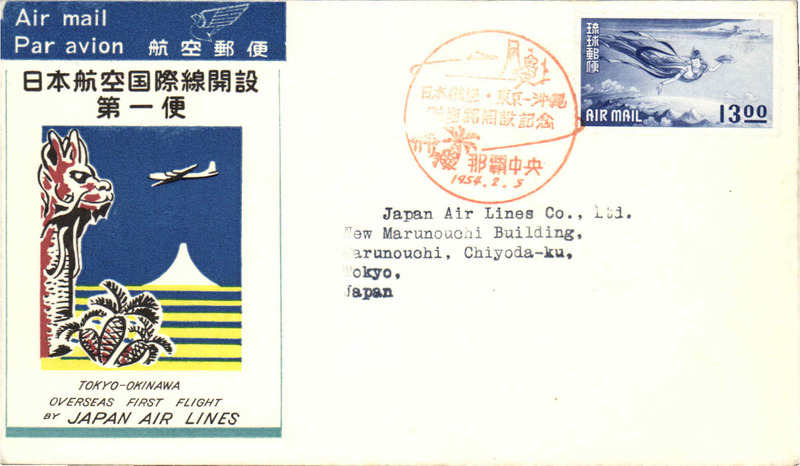 Japanese Airlines, first DC-8, Tokyo-, cachet, b/s, etiquette, air cover, 21x10cm. 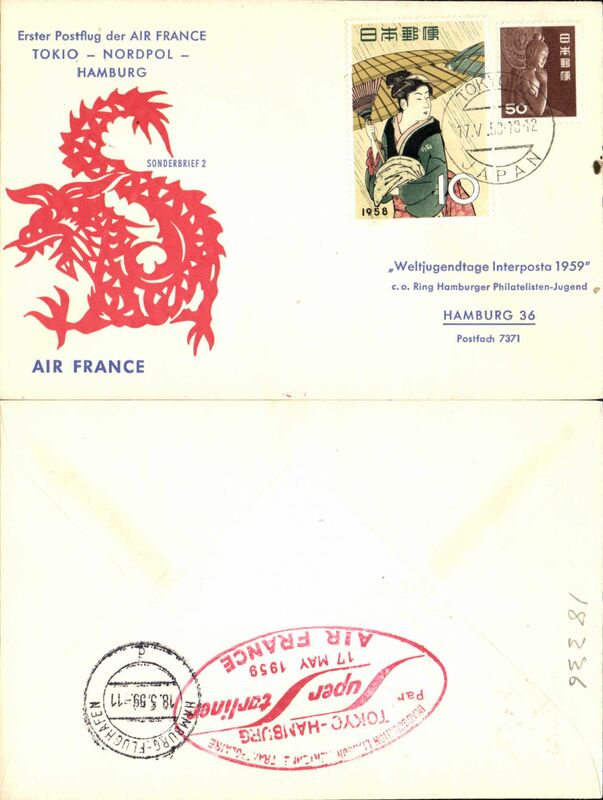 F/F Tokyo-Frankfurt, b/s, cachet, souvenir cover, Lufthansa. JAL first polar flight Tokyo you London, souvenir cover, cachet, b/s/s. 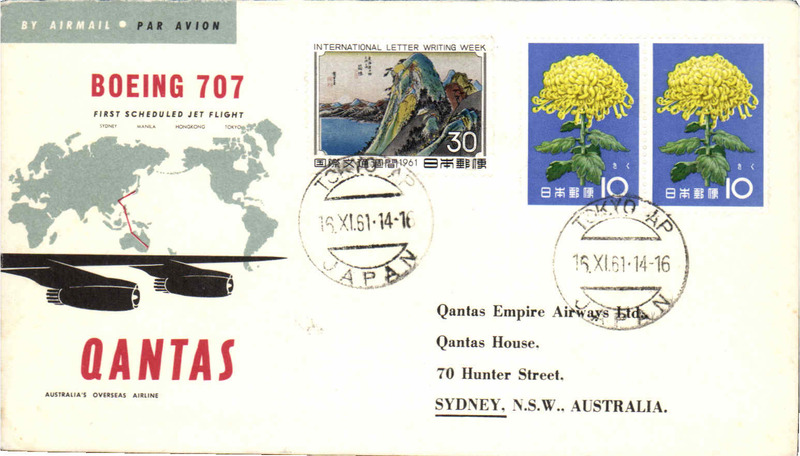 Qantas, First B-707, Tokyo-Sydney, company souvenir cover, cachet, b/s. F/F, Tokyo-Jakarta, cachet, b/s, souvenir cover, JAL. 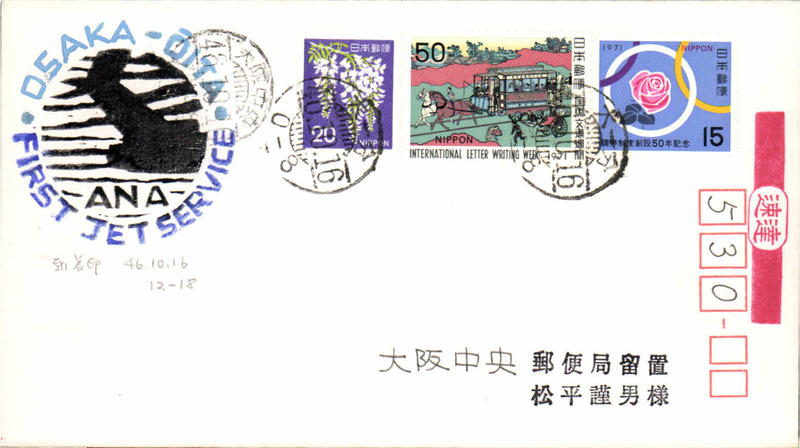 Pan Am, 15th anniversary Round the World Service, Tokyo-Tokyo, cachet, b/s 4/10, souvenir cover. 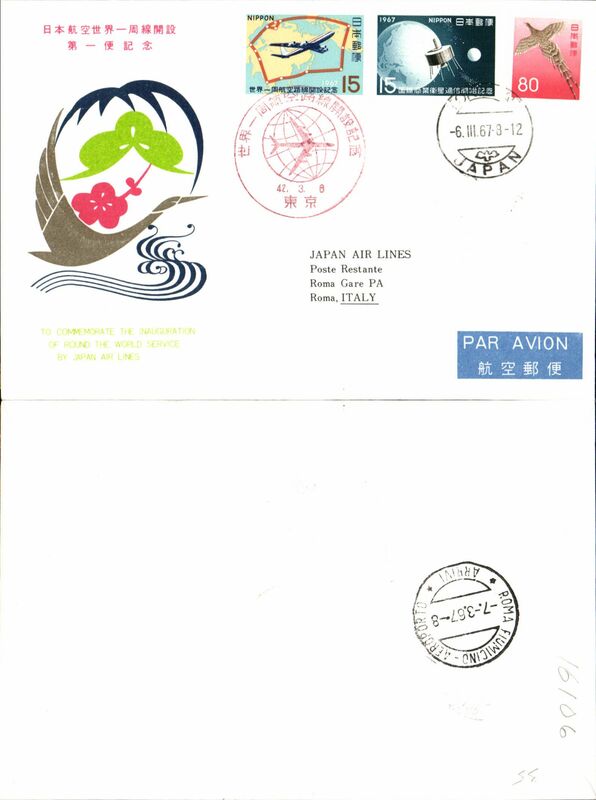 Japanese Airlines, F/F Tokyo-Rome, special depart cancellation, b/s, souvenir cover. 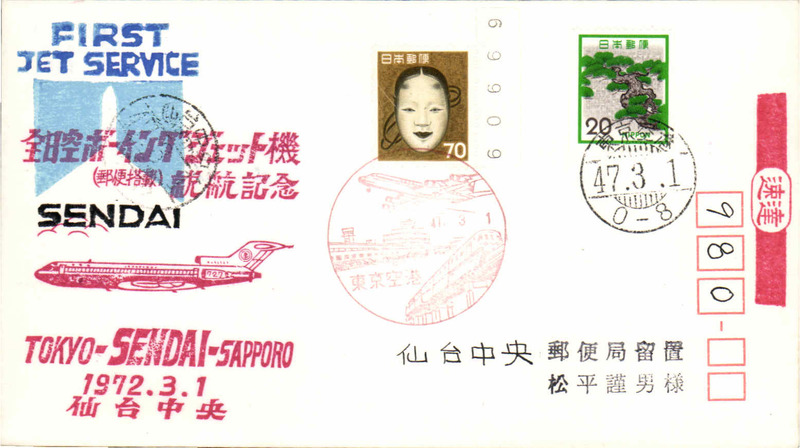 F/F inauguration of Southern route, Tokyo to Frankfurt, b/s, illustrated souvenir cover, JAL. 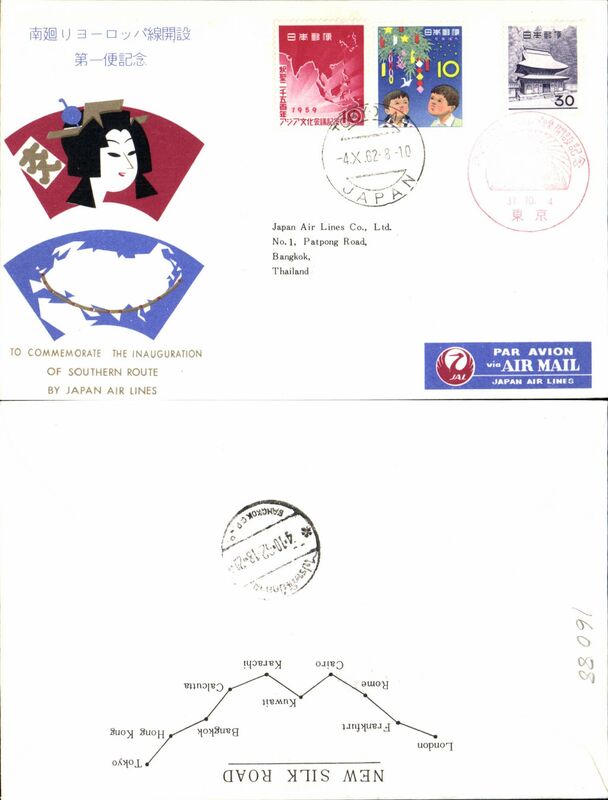 F/F inauguration of Southern route, Tokyo to Bangkok, b/s, illustrated souvenir cover, JAL. 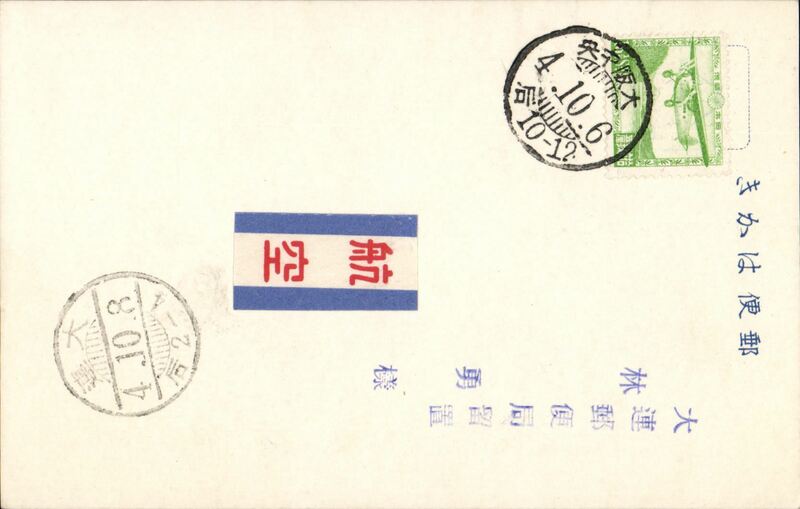 F/F inauguration of Southern route, Tokyo to Cairo, b/s, illustrated souvenir cover, JAL. 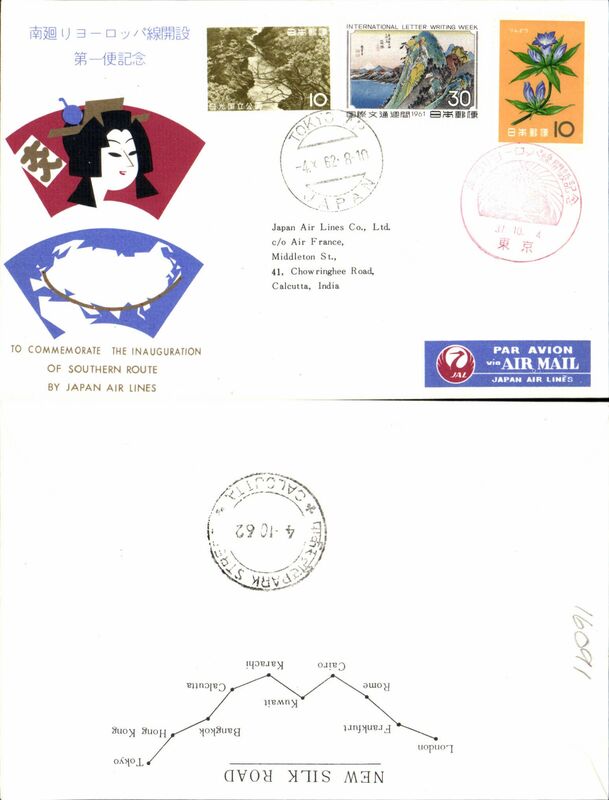 F/F inauguration of Southern route, Tokyo to Calcutta, b/s, illustrated souvenir cover, JAL. 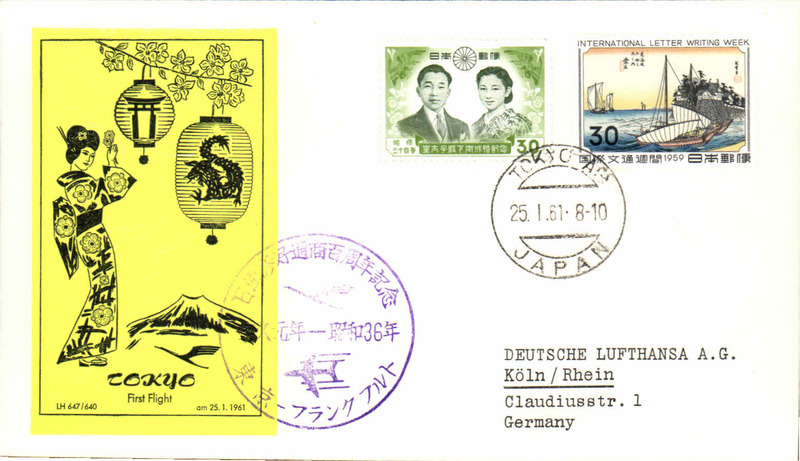 Lufthansa, Rome acceptance for F/F Frankfurt-Tokyo, cachet, b/s, souvenir cover posted in the Vatican. 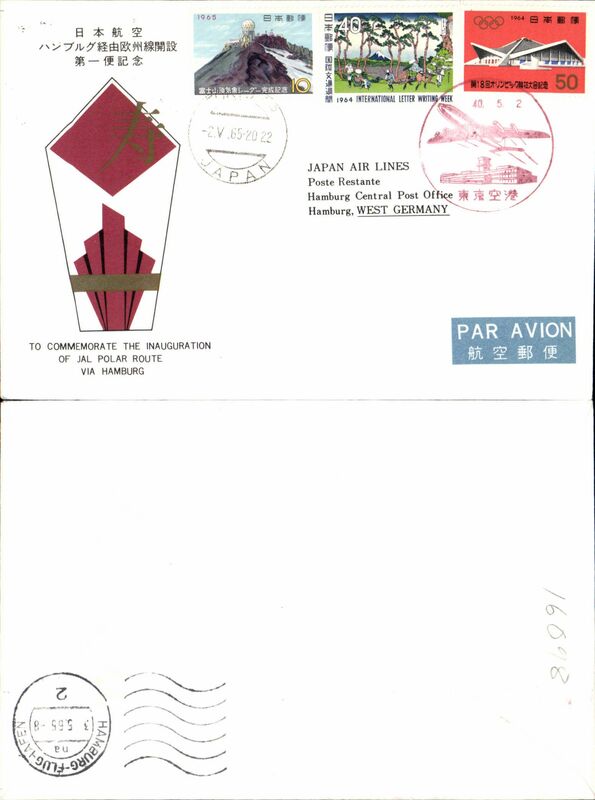 F/F inauguration of Polar route, Tokyo-Hamburg, b/s, illustrated souvenir cover, JAL. 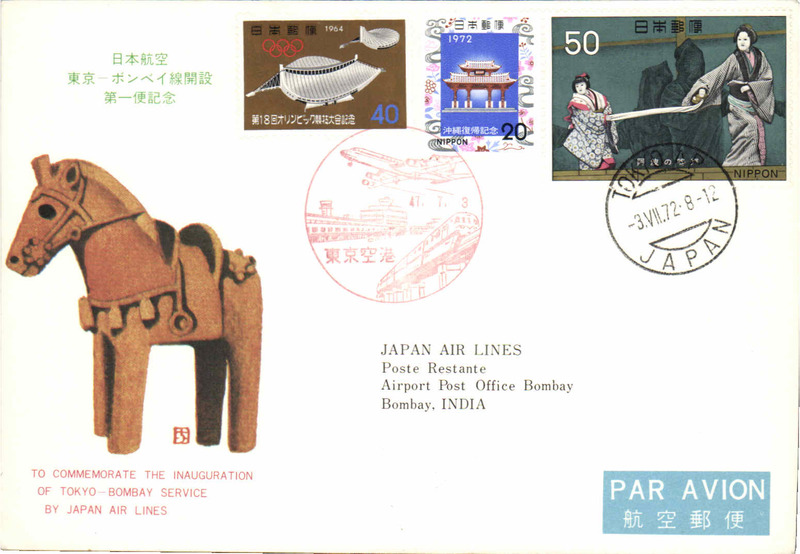 F/F inauguration of Polar route, Tokyo-New Delhi, b/s, illustrated souvenir cover, JAL. 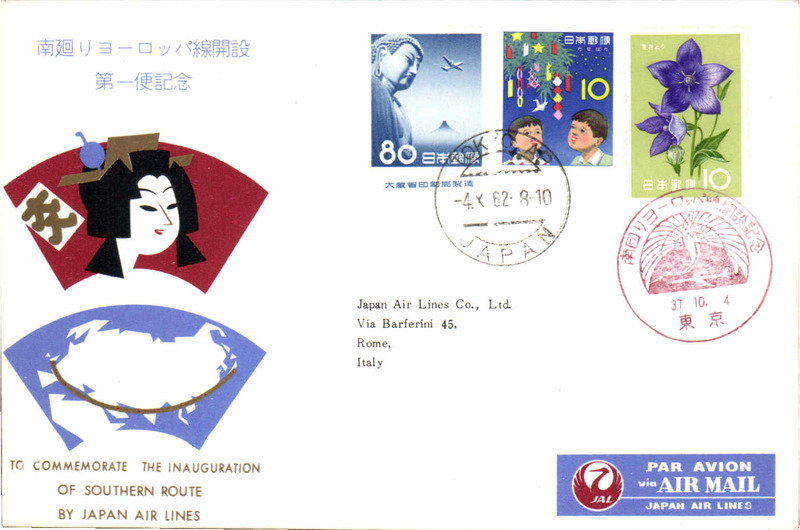 F/F inauguration of New Silk Road route, Tokyo-Tehran, b/s, illustrated souvenir cover, JAL. 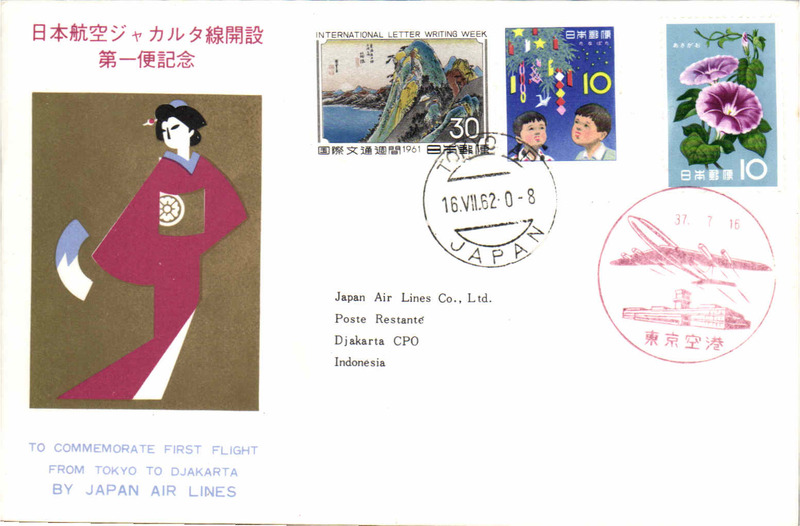 F/F inauguration of Polar route, Tokyo-Amsterdam, b/s, illustrated souvenir cover, JAL. 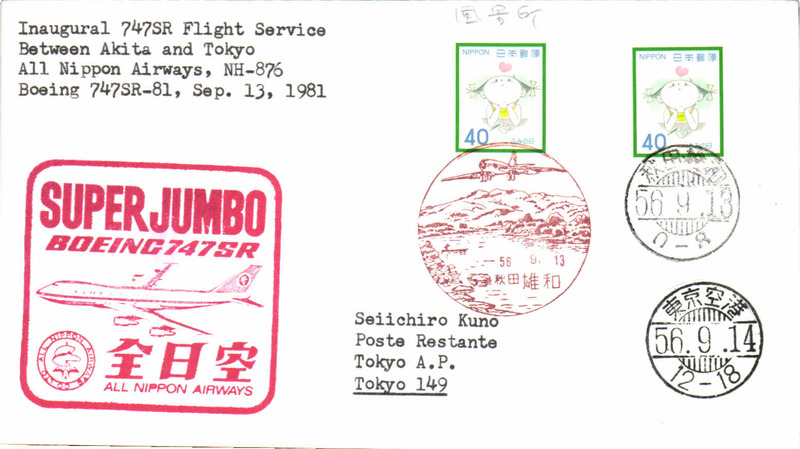 F/F inauguration Round the World Service, Tokyo-Rome, b/s, illustrated souvenir cover, JAL. 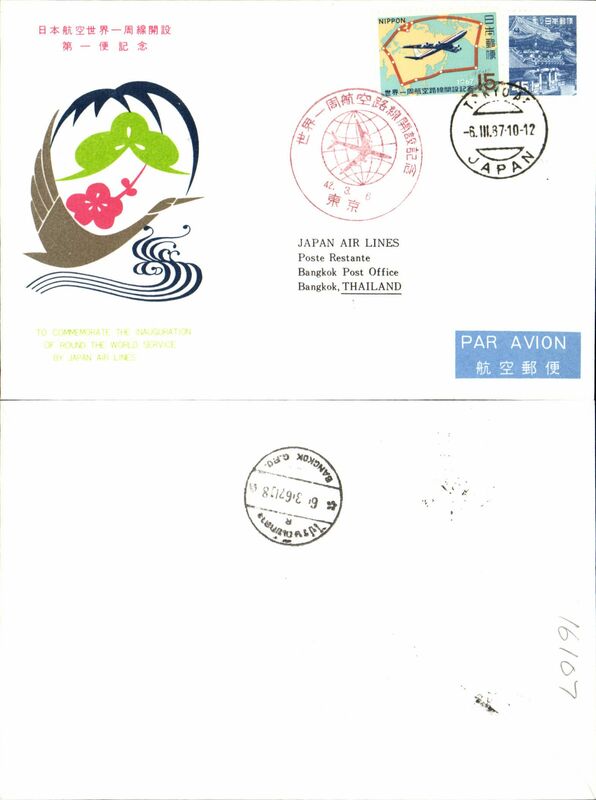 F/F inauguration Round the World Service, Tokyo-Bangkok, b/s, illustrated souvenir cover, JAL. 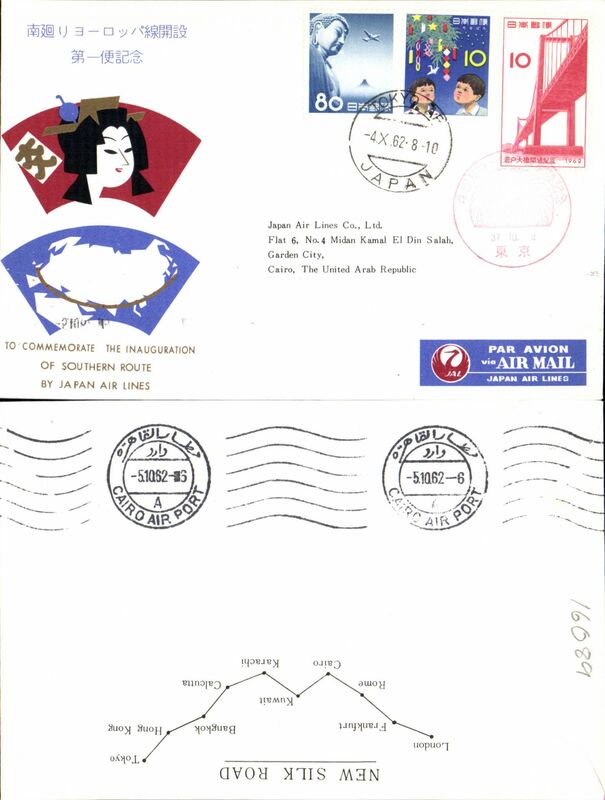 F/F inauguration Round the World Service, Tokyo-Tehran, b/s, illustrated souvenir cover, JAL. 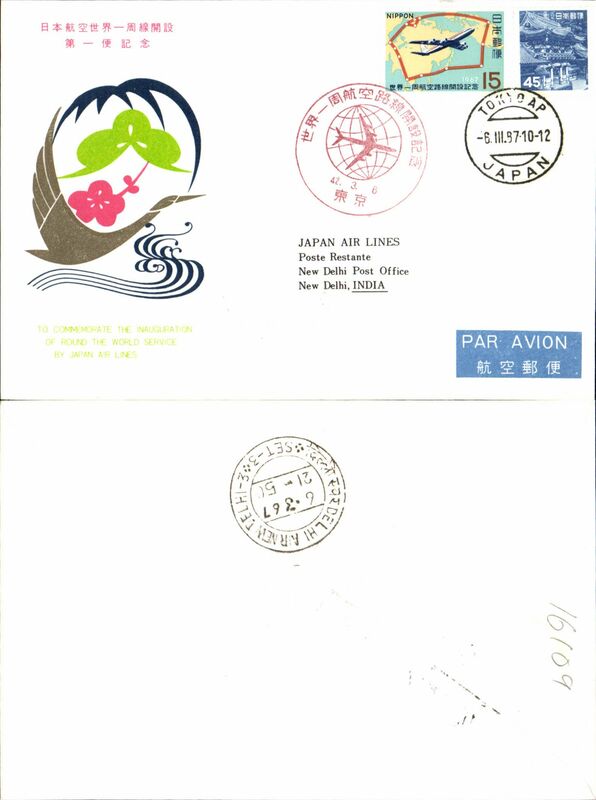 F/F inauguration Round the World Service, Tokyo-New Delhi, b/s, illustrated souvenir cover, JAL. 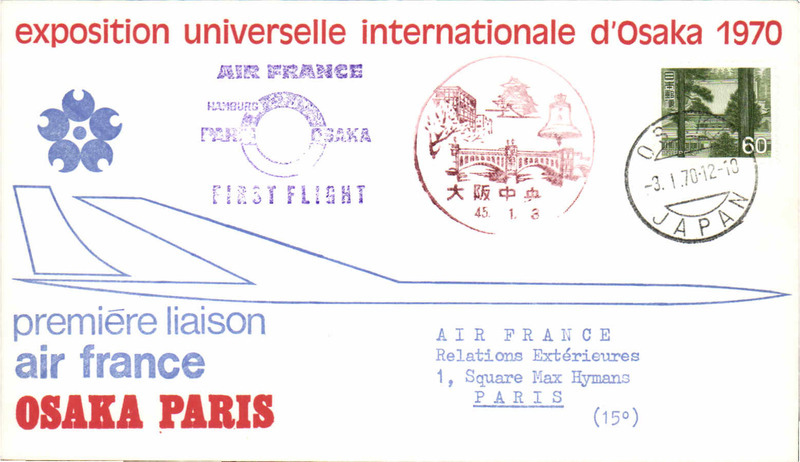 F/F inauguration Round the World Service, Tokyo-Paris, b/s, illustrated souvenir cover, JAL. 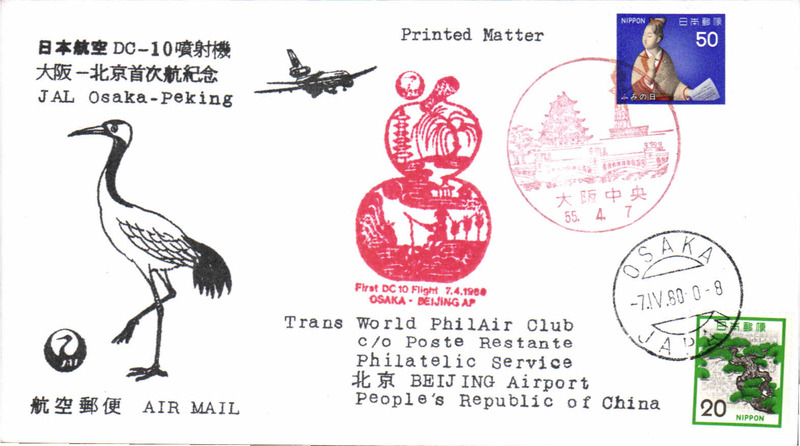 Inauguration of full circle around the world, cachet, b/s, souvenir cover, JAL. 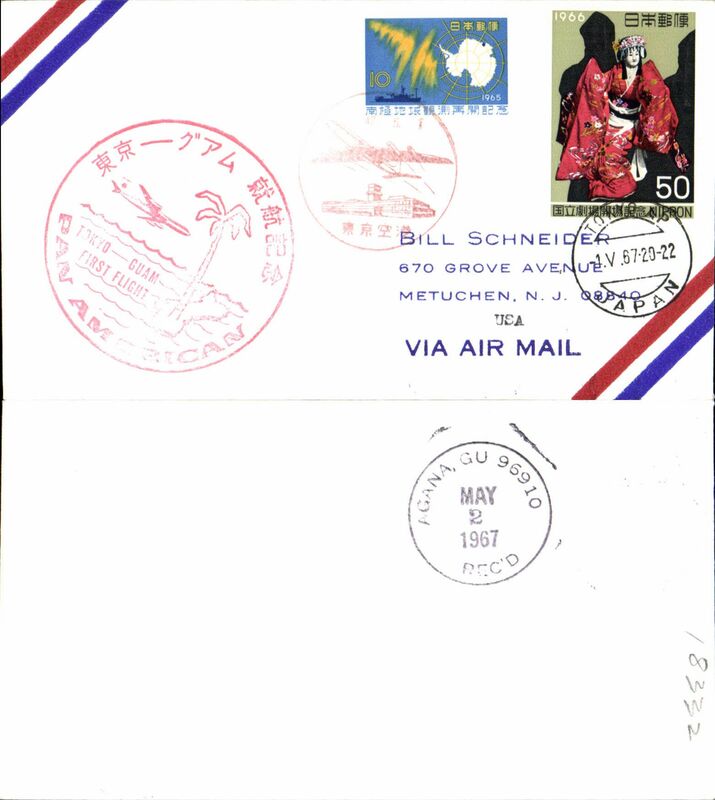 Northwest Airlines, F/F Osaka-New York, special cancellation, cachet, b/s. 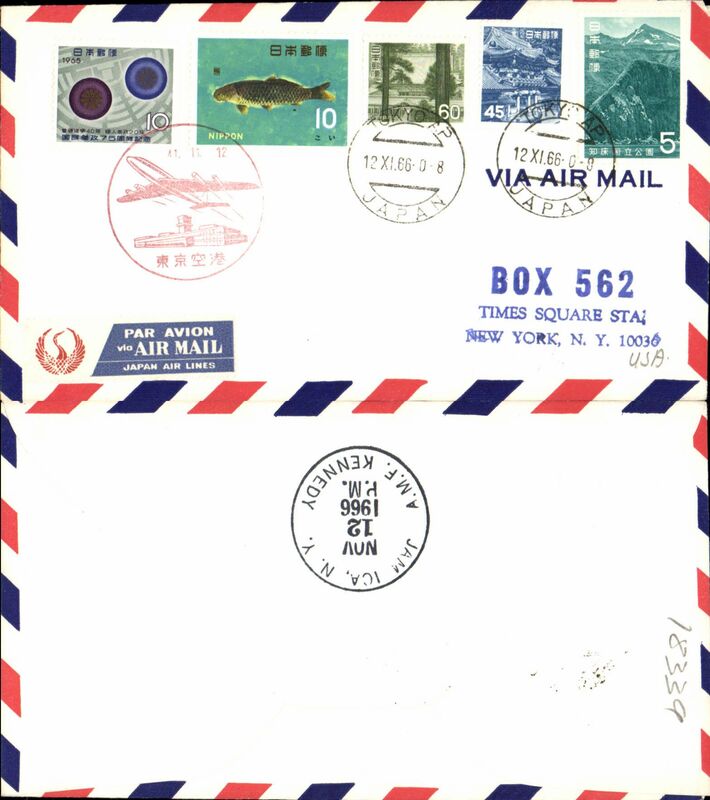 Pan Am F/F Tokyo-Guam, airmail cover, flight cachet, b/s. 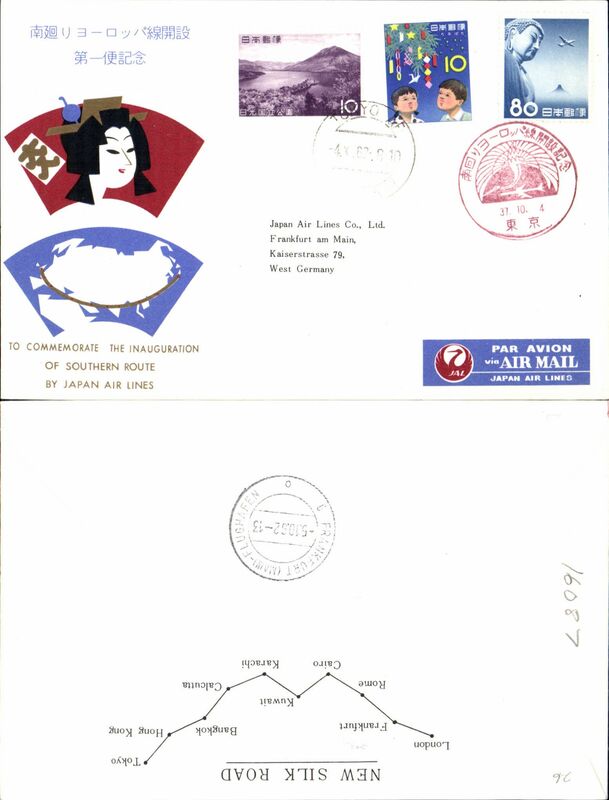 F/F inauguration Round the World Service, Tokyo-Kuala Lumpur, b/s, illustrated souvenir cover, JAL. 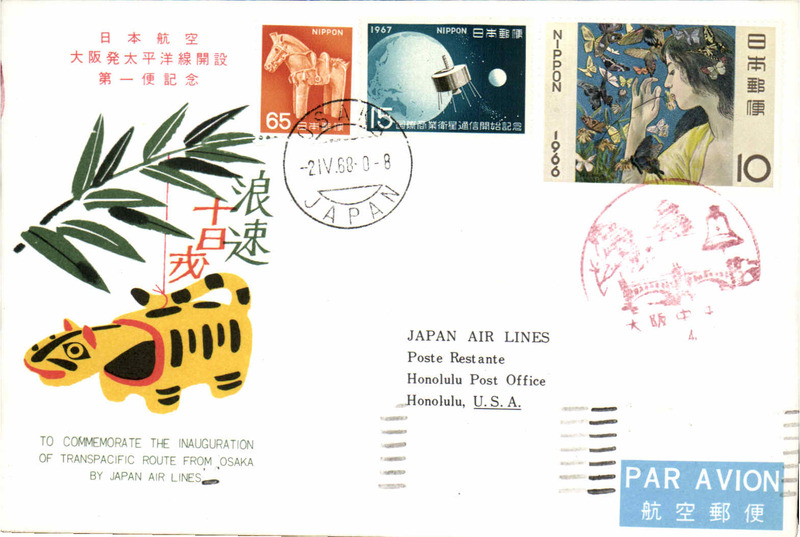 Japanese Airlines, F/F, Osaka-Honolulu, cachet, b/s, etiquette souvenir cover. F/F 'Sunset Express' Tokyo-Paris, cachet, souvenir cover, b/s, Air France. 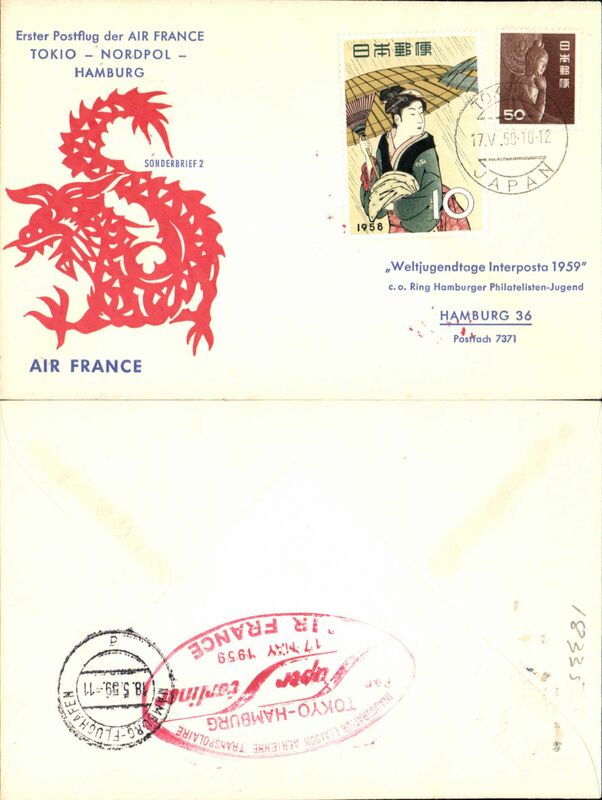 F/F, Tokyo-Paris, souvenir cover, b/s, Air France. 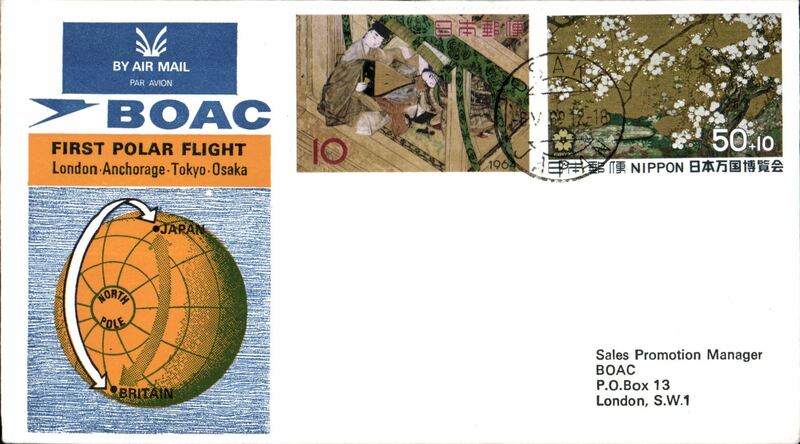 F/F Tokyo to London, cachet, sovenir cover, BOAC. First jet service, Osaka-Oita, cachet, arrival ds, All-Nippon Airways. 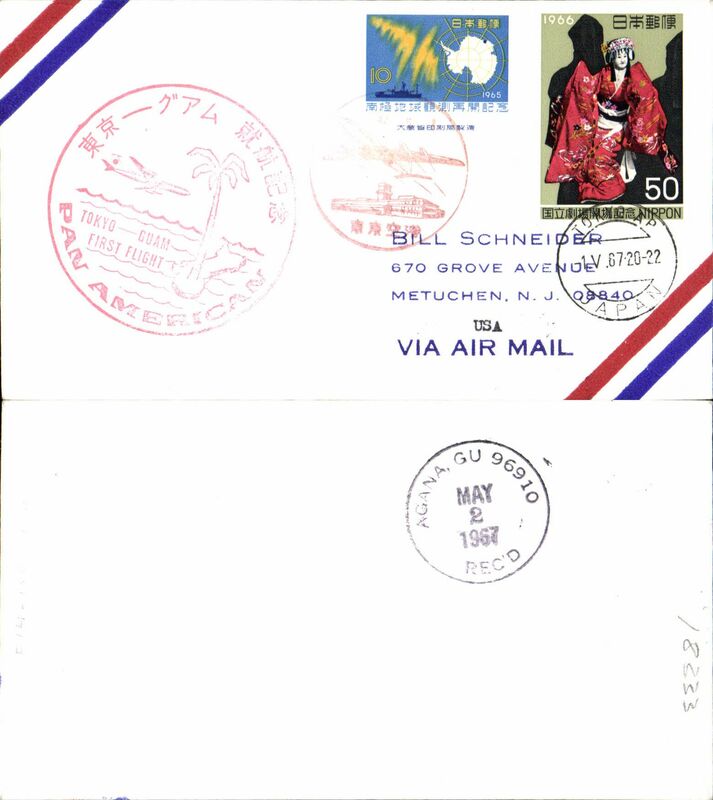 F/F's Tokyo-Sendai, and Sendai-Tokyo, two souvenir covers, cacheted and backstamped. 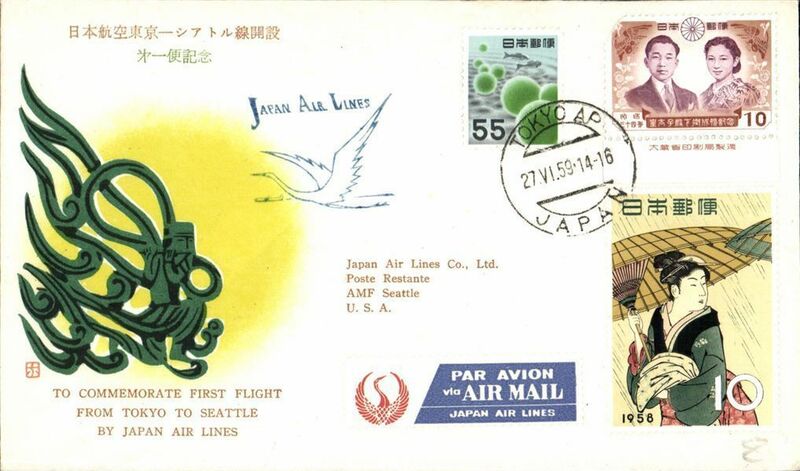 Japanese Airlines, F/F, Tokyo-Bombay, cachet, b/s, etiquette, souvenir cover. 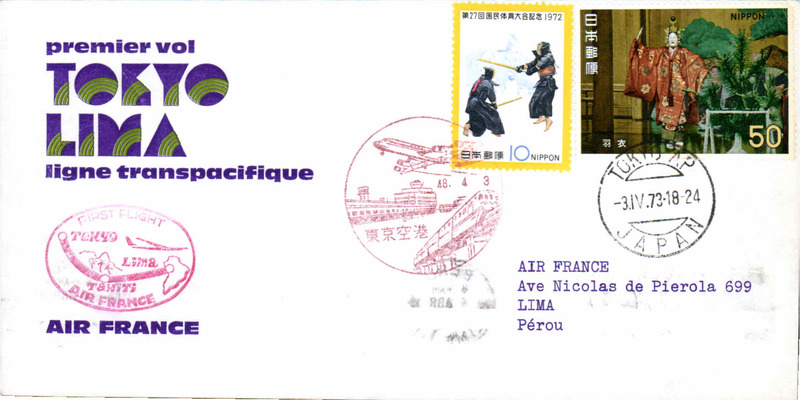 F/F Tokyo-Lima, cachet, souvenir cover, b/s, Air France. 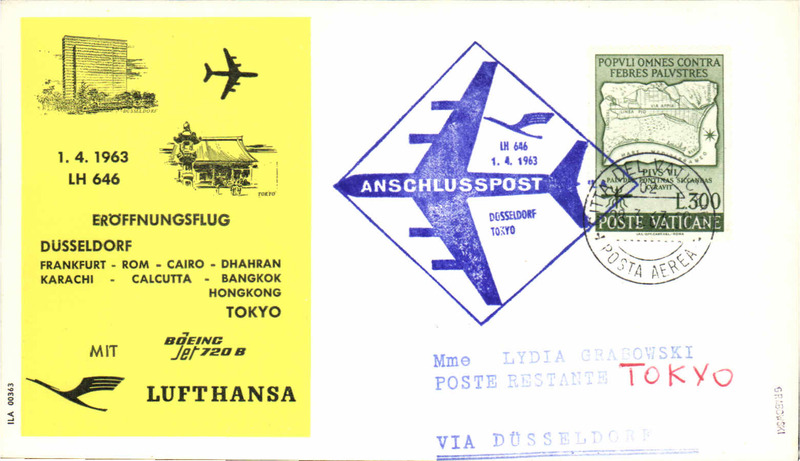 Lufthansa, F/F DC10, Rome-Tokyo, cachet, b/s, souvenir cover posted in Vatican. 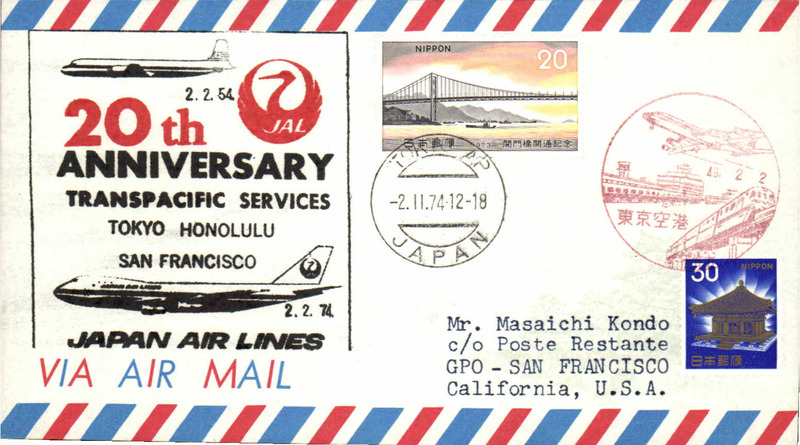 Japanese Airlines, 20th anniversary TransPacific services, Tokyo-San Francisco, cachet, b/s, etiquette, souvenir cover. 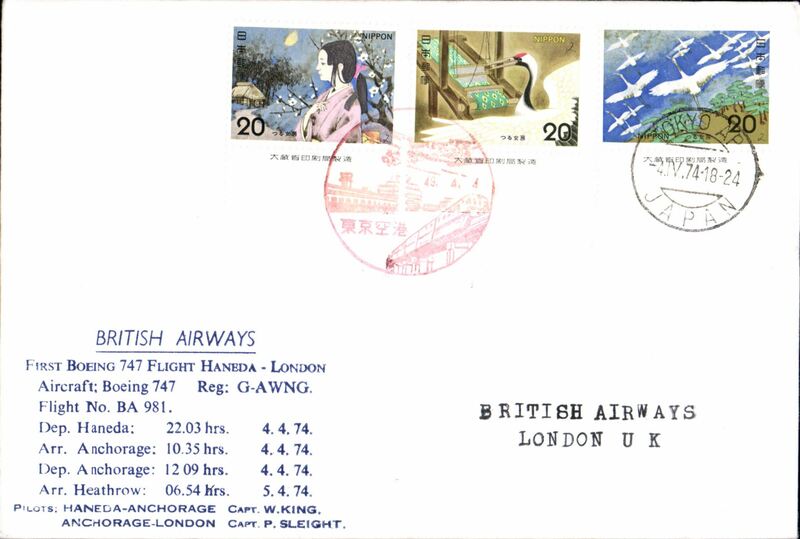 British Airways F/F Haneda to London 5/4 via Anchorage 4/4, souvenir cover franked 60y, special flight cachet. Image. 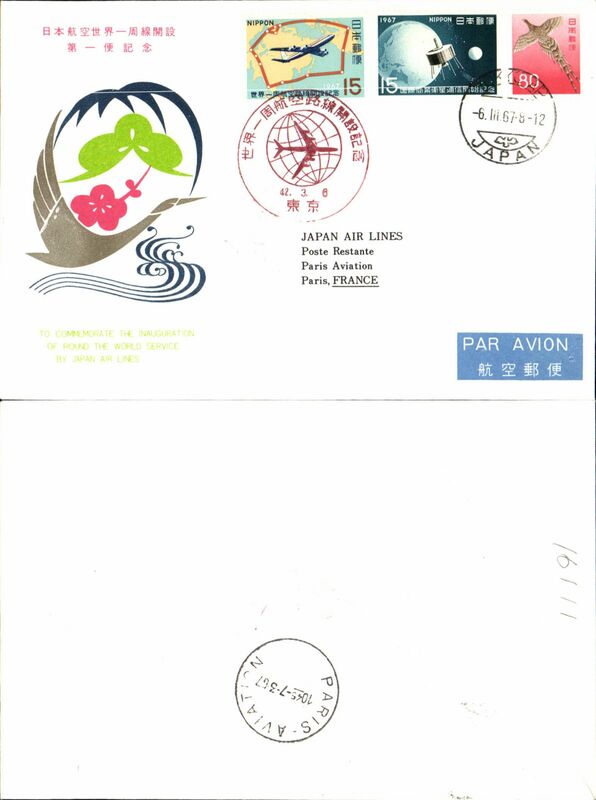 Korean Airlines, F/F Tokyo to Seoul, bs, air cover franked 40y, red flight cachet. 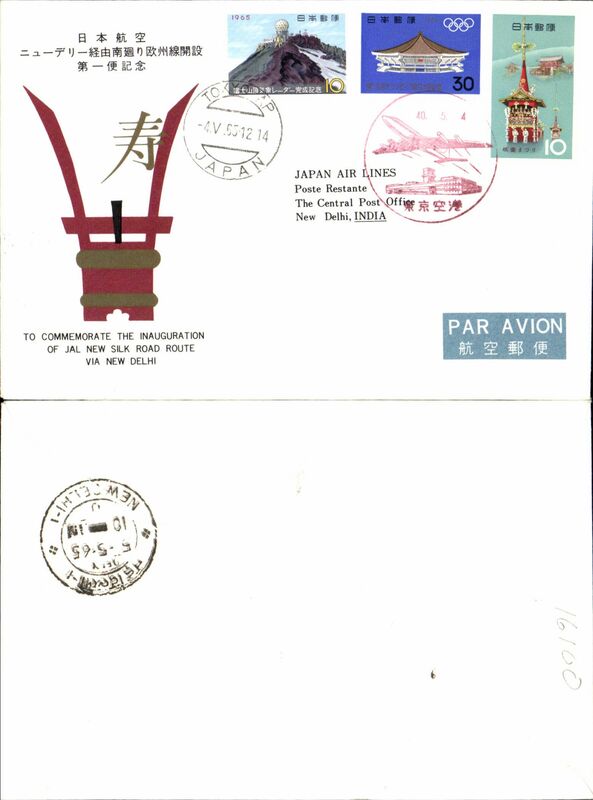 Air India, F/F Tokyo-Delhi, special depart cancellation, b/s, souvenir cover. 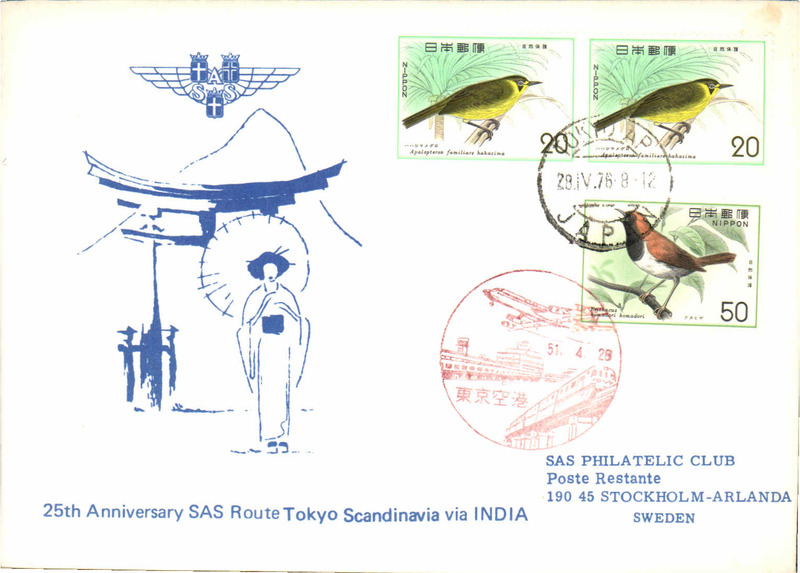 SAS 25th anniversary Tokyo-Stockholm, special cancellation, b/s, souvenir cover. 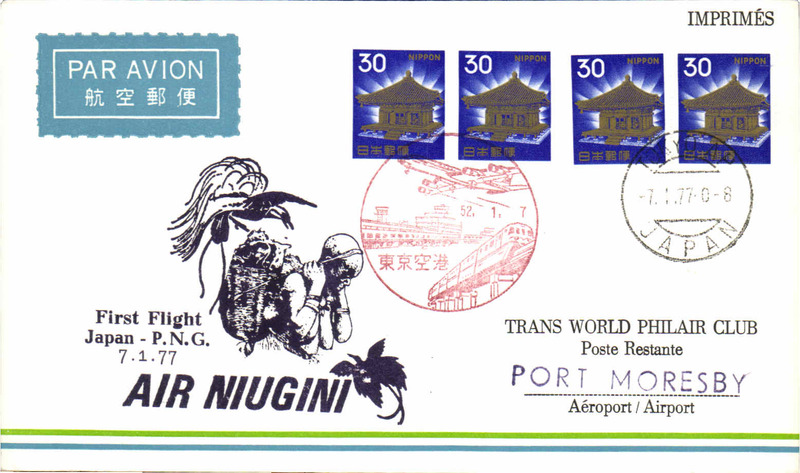 Air Niugini, F/F Kagoshima-Port Moresby, special cancellation, cachet, b/s, souvenir cover. 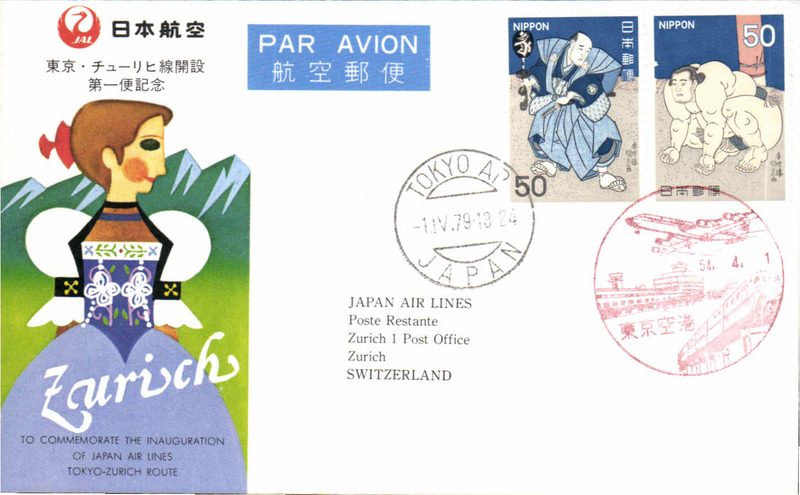 JAL F/F Tokyo-Zurich, cachet, b/s, souvenir cover. 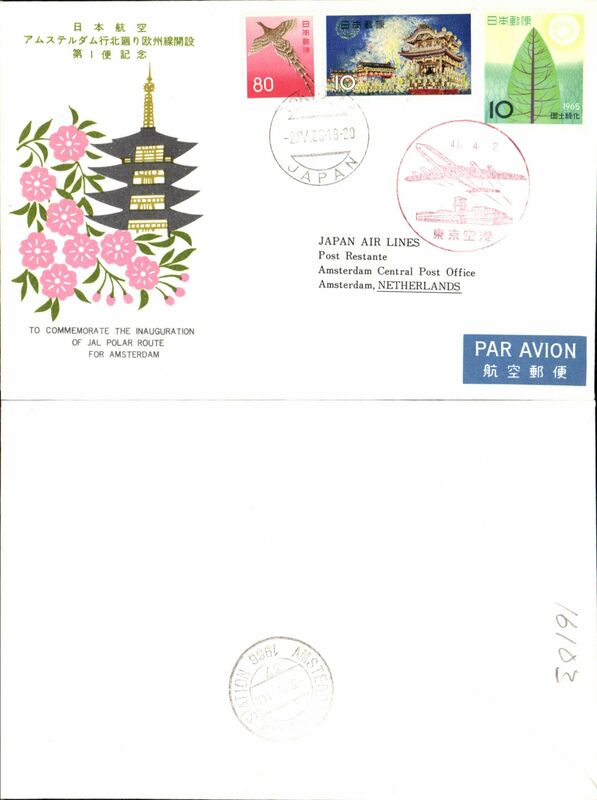 JAL F/F Zurich-Tokyo, b/s, souvenir cover. 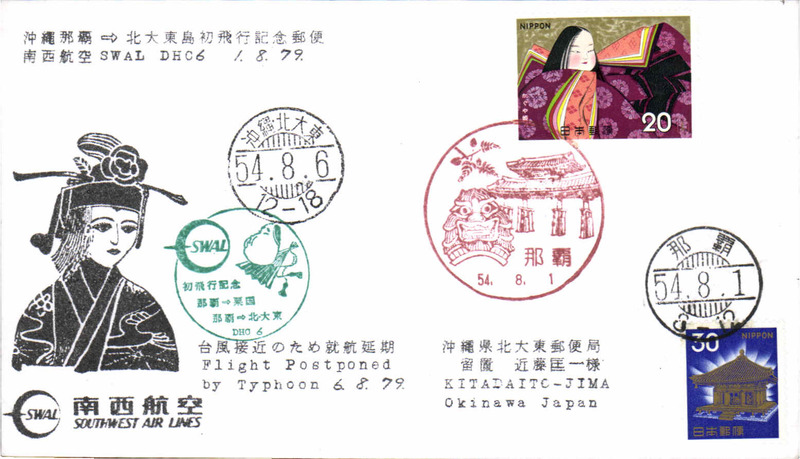 Nippon Kinkyori Airlines, F/F Tsushima-Hakata, special depart cancellation, cachet, arrival ds, souvenir cover. 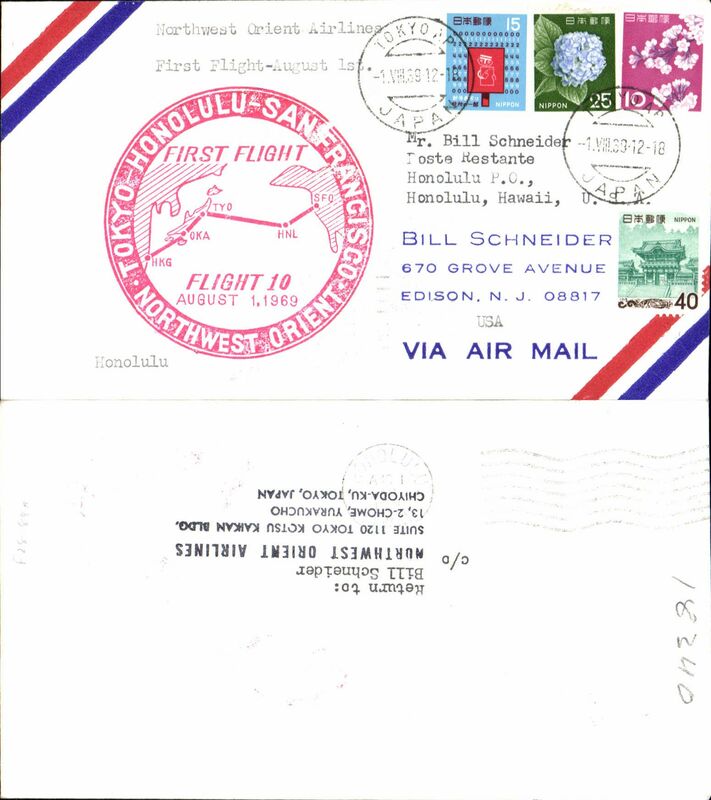 Southwest Airlines, Ryuku Islands internal service, first DH C6, Kitadaito-Jima to Okinawa, special depart cancellation, cachet, arrival ds, souvenir cover. Flight postponed by typhoon until 6/8/79. 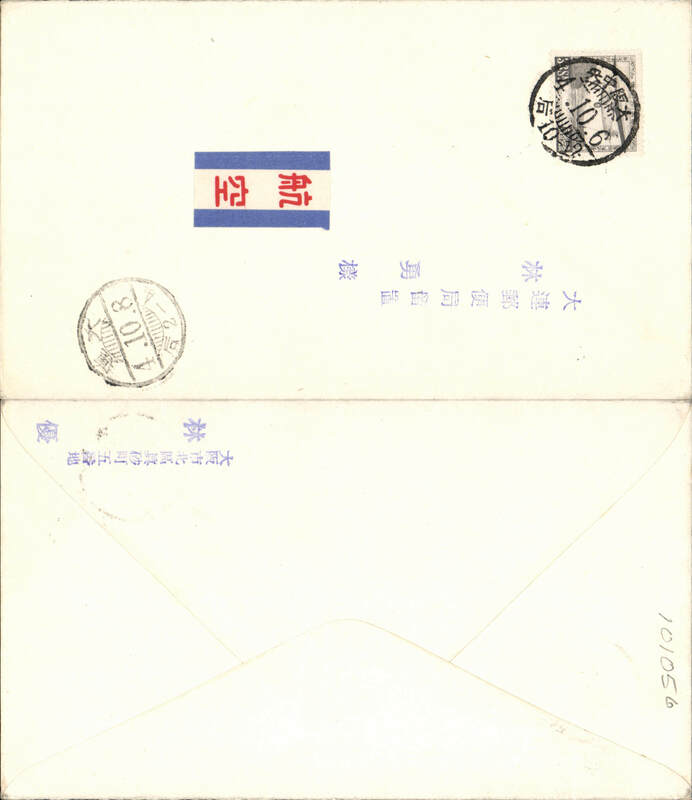 Japanese Airlines, F/F, Osaka-Peking, cachet, b/s, etiquette, souvenir cover. 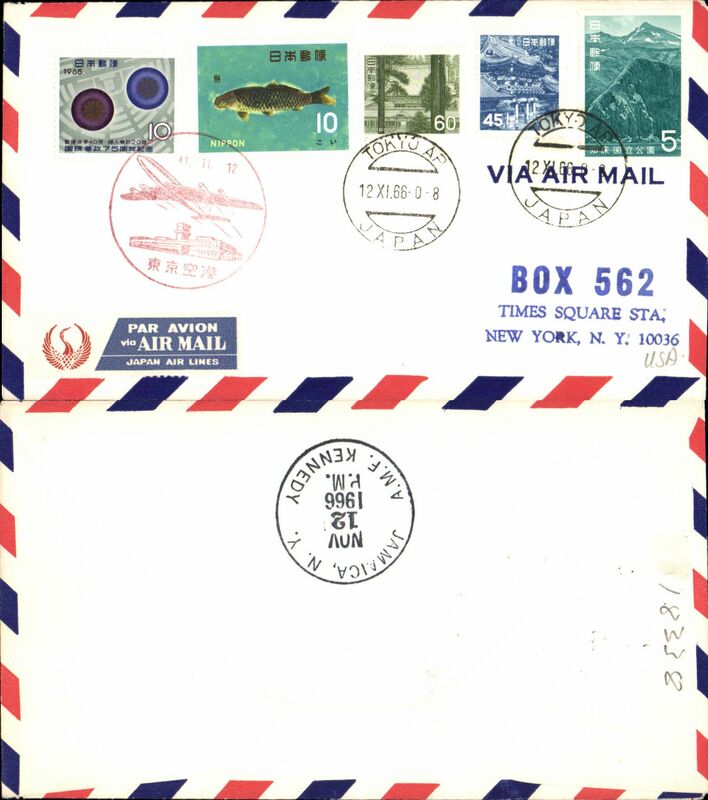 Pan Am, first direct B747, Tokyo-New York, cachet, b/s, souvenir cover. 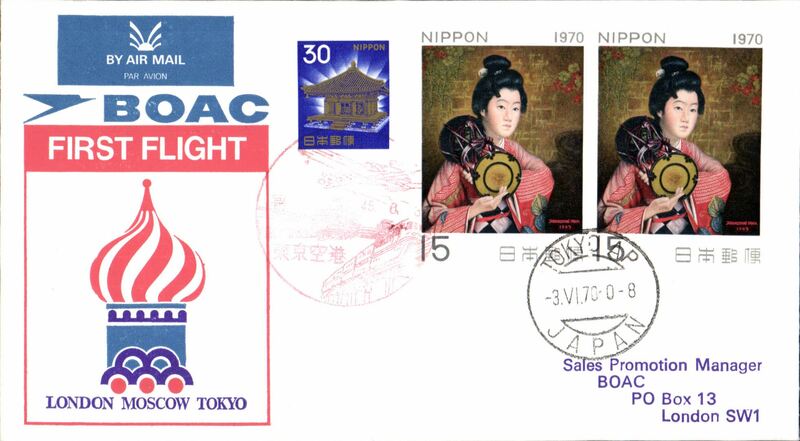 TOA Domestic AL, Tokyo-Kagoshima, special depart cancellation, cachet, b/s, souvenir cover. 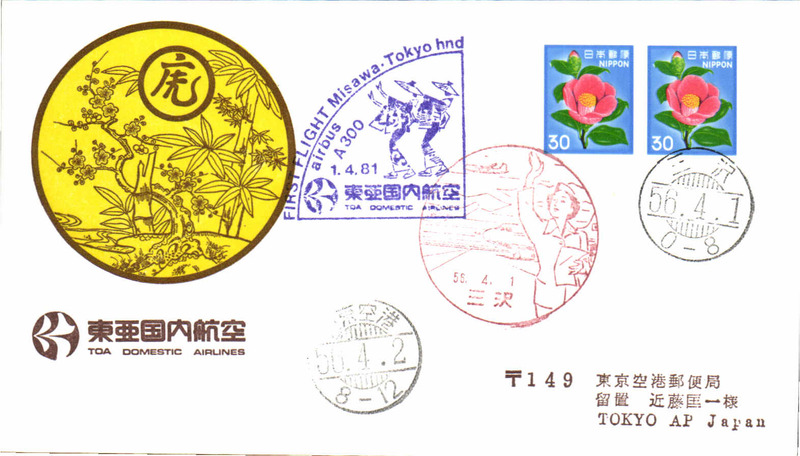 TOA Domestic Airlines, First A 300 Misawa-Tokyo, special cancellation, cachet, b/s, souvenir cover. 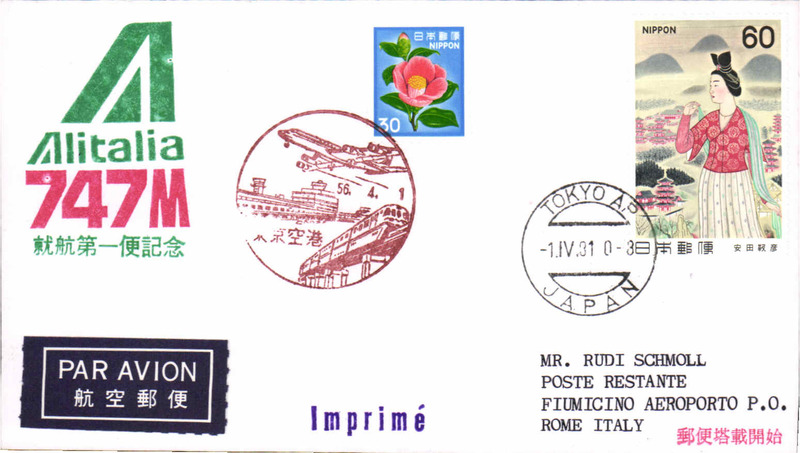 F/F B747, Tokyo-Rome, bs, souvenir cover, Alitalia. 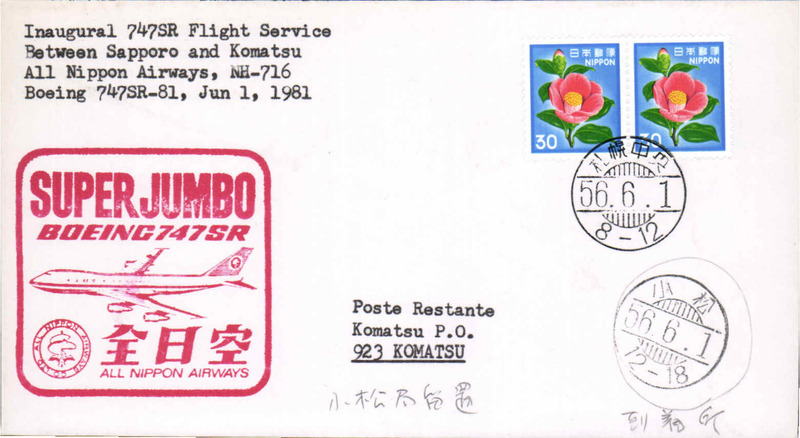 All Nippon Airways, First Super Jumbo 747SR, Sapporo-Komatsu, special cancellation, b/s, souvenir cover. 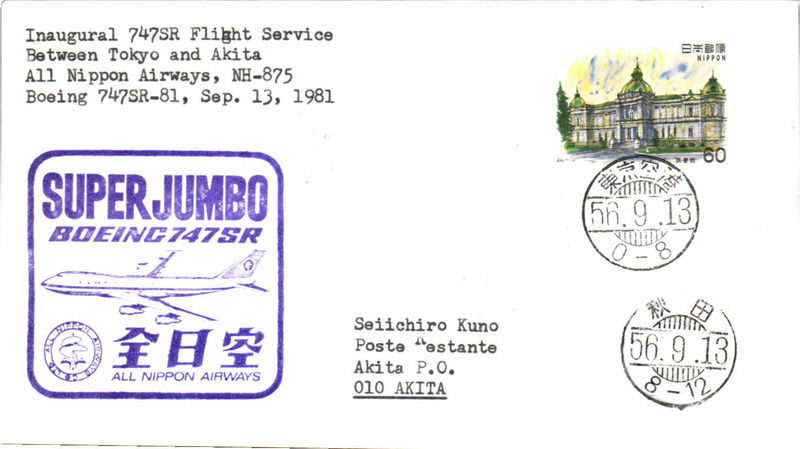 All Nippon Airways, First Super Jumbo 747SR, Tokyo-Akita, special cancellation, b/s, souvenir cover. 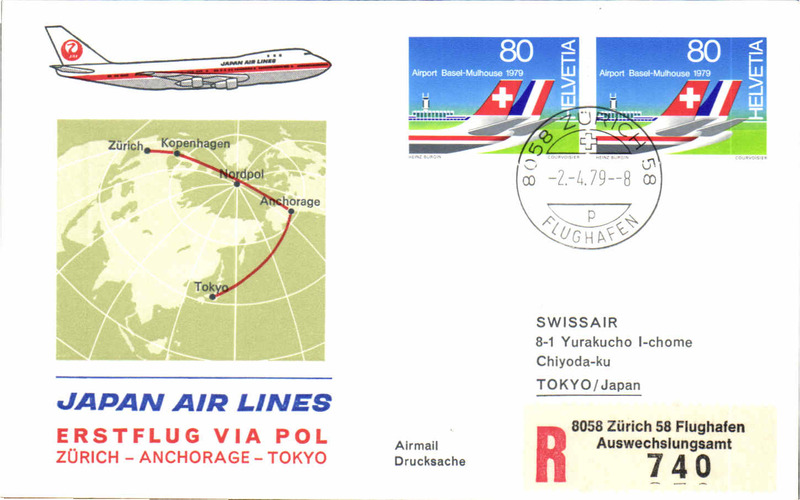 All Nippon Airways, First Super Jumbo 747SR, Akiya-Tokyo, special cancellation, b/s, souvenir cover. United AL, F/F Tokyo-Seattle, special depart cancellation, cachet, b/s. 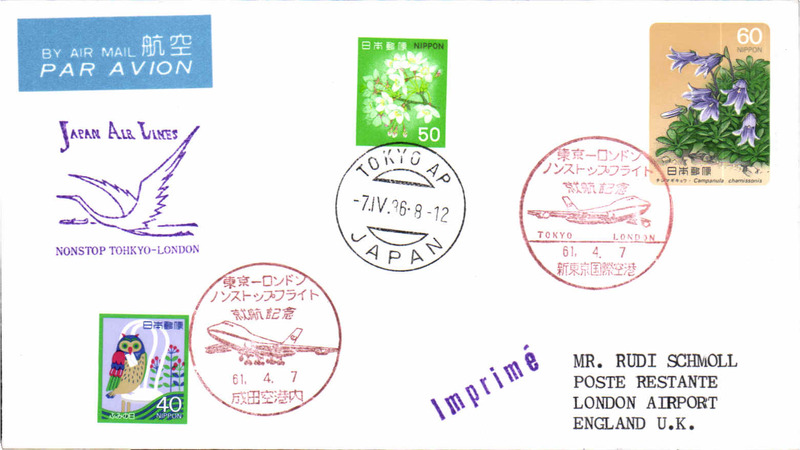 JAL first non-stop Tokyo-London, b/s, cachet, souvenir cover.